There’s three days left to go in the third edition of Vivid Sydney. a light, music and ideas extravaganza held in and around the Sydney CBD. The website and associated app gives you plenty of information – but probably not from this perspective. 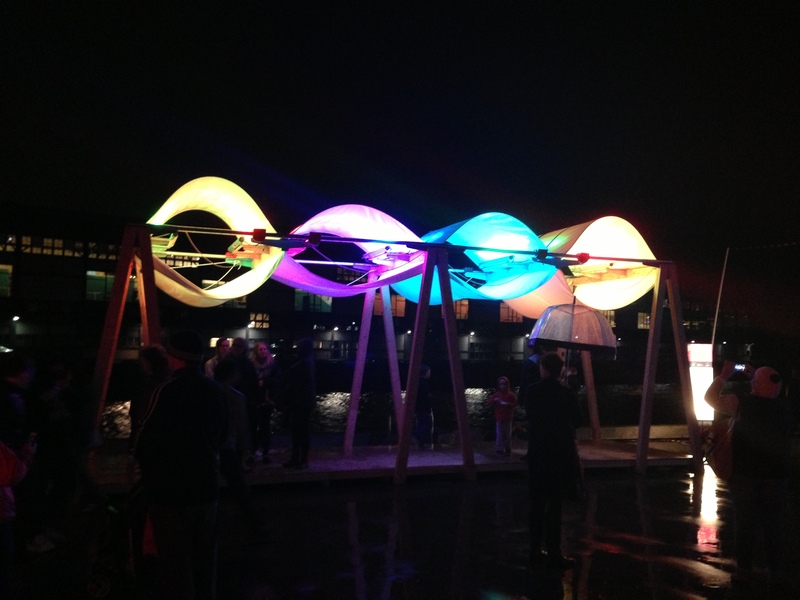 In the horseshoe between Walsh Bay and the Sydney Opera House, there are 60 light installations. It’s a terrific walk and you also get to see parts of Sydney that aren’t on tourist maps. The installations are numbered 1 to 60, and the BotF suggestion is to start at installation number 60 (The Dalgety Line) in Walsh Bay AFTER you’ve enjoyed one of the great pubs in the Rocks. The lights turn on at 6pm – so the best bet is to get a feed in early and then head down to the water’s edge. I took the bladdamasta clan to the Australian Hotel for a pre-Vivid feed, but the Glenmore, with its rooftop bar, or the Lord Nelson, with its great beer range would do the trick equally as well. 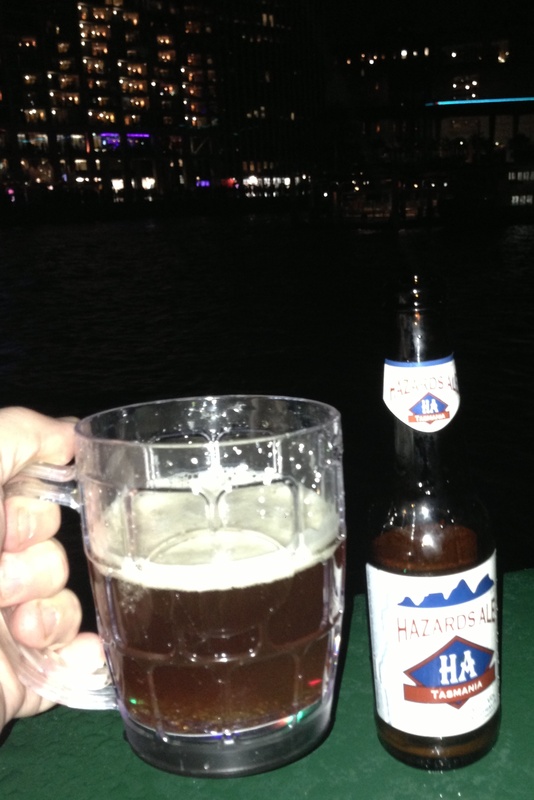 The mid-week go was to duck into Harts Pub where you can rip into a pint of VPA or Vivid Pale Ale. Made by the Rocks Brewing Co – this is a one-off available at a number of bars in the Rocks including the Orient and the Paragon. 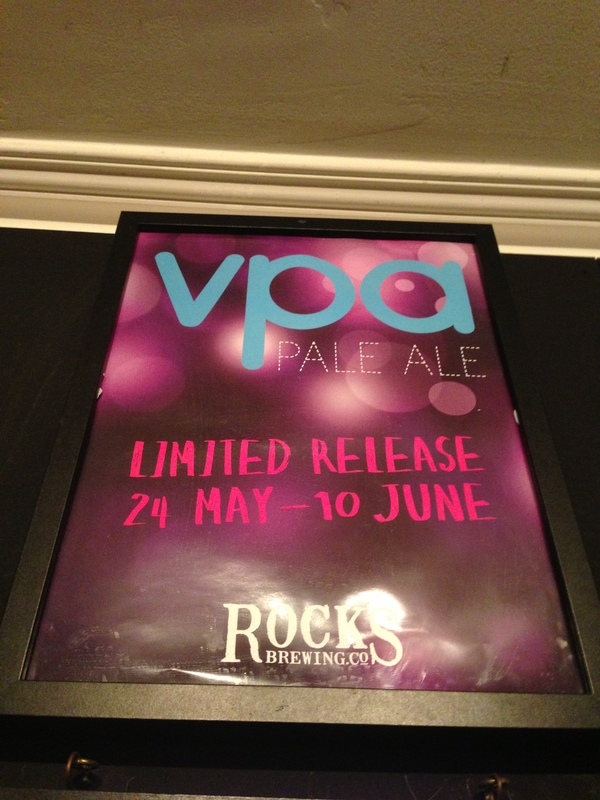 I actually had my first VPA at the ‘Goon – but honestly think they’d replaced the taphead with the VPA symbol, but hadn’t changed the tap line from Pure Blonde. Very underwhelming. I gave it another go at the source (aka Harts) and found it to be much better. There’s a pleasant tang to the VPA (lime and Hop) without being too challenging. Sessionable for sure. For mine the star of Vivid remains the Sydney Opera House. The installation at Customs House has also had rave reviews, but you just can’t beat what they’ve been able to create on it. Naturally the best place to be and the best place to get photos is from the Back of the Ferry. You also get the best view of the installation on Fort Denison, which is I think meant to be some underwater foliage – gone large. Whatever – looks good. From a beer lover’s perspective, having an @Untappd unique out the back of the ferry watching the light show is just the best. 6.30 ferry is best to get – because you get on with 10 minutes to spare and get a good 15 minute trip. 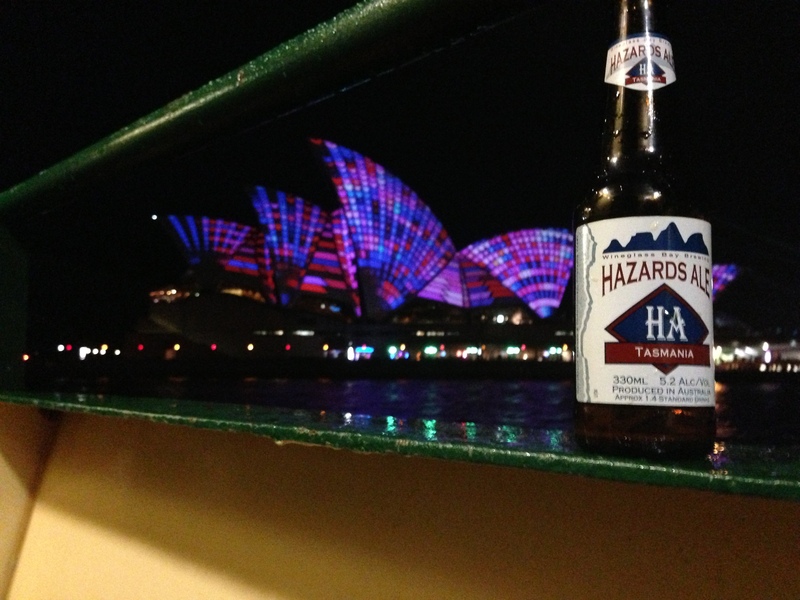 The Australian Hotel sells takeaway and a I snaffled a rarity from Tassie called Hazards Ale. The only output from the exotically named Wineglass Bay Brewing Pty Ltd, this is a meaty, hearty ale. It possesses a rugged but not unpleasant edge. One to savour and is real malt treat. Perfect for the crisp autumn voyage. So if you haven’t done Vivid – then hop to it.